Soybean prices are as low as they’ve been in a decade, and corn prices aren’t any better. Last week I delivered a presentation on the topic of agricultural trade in the Trump Era to farmers in Northeastern Montana, and the theme I hammered was the role uncertainty plays in the markets, and how President Trump’s sharp rhetoric about the “rules-based post-war international order” has injected a degree of uncertainty into the marketplace not seen in quite some time. 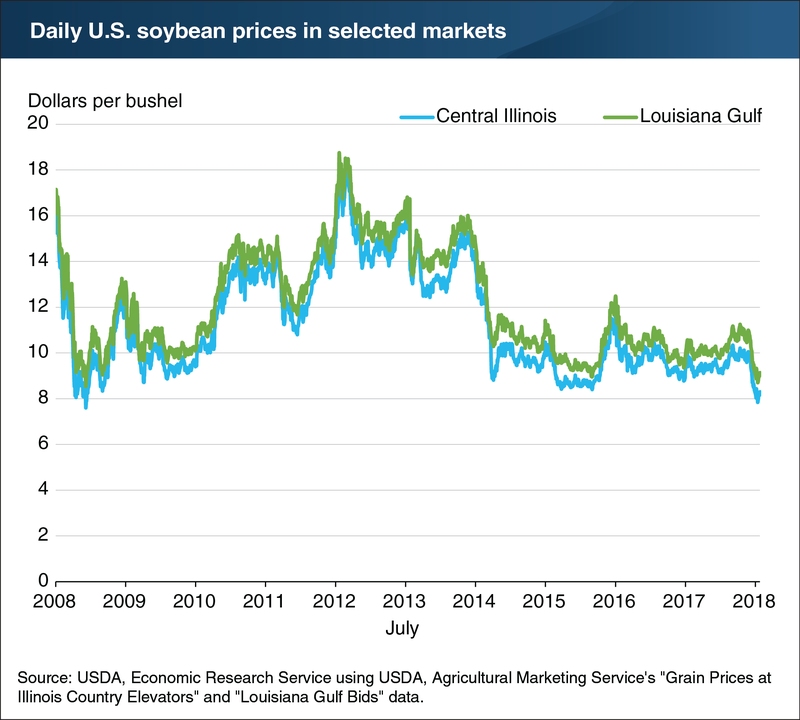 The U.S. Department of Agriculture noted back in August that soybean prices had hit nine-year lows, shedding nearly $2.00/bushel in value in roughly a month’s time (see figure below). Looking at current cash grain prices – $7.90 in Central Illinois as of last Thursday – it’s clear that projections of a large crop this harvest haven’t given marketers any reason to chase prices higher. What role does the Trump Doctrine on trade play in all of this? Well, consider the United States’ global market share in recent years as one indication. As the Economic Research Service noted last week, the U.S. simply isn’t capturing any of the growth in the global grain trade (see figure below). 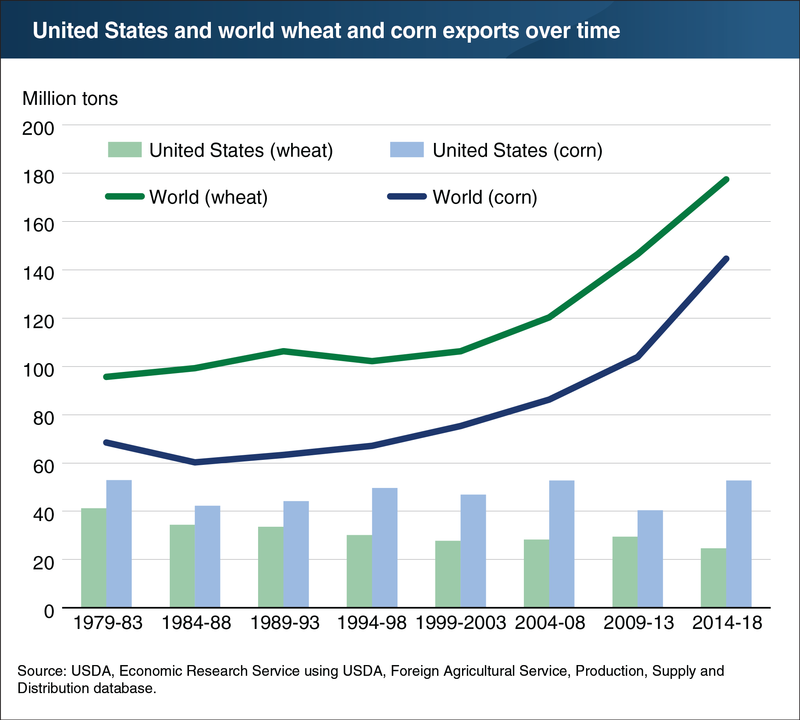 Since 2000, the U.S. has captured roughly a third of global wheat exports and 70% of global corn trade, but as global exports have gained momentum over the past two decades, U.S. trade has held fairly steady. Is that a direct repudiation of U.S. trade policy? No, of course not. However, consider that if the U.S. willingly makes itself less competitive at a time when it’s already facing stiff competition from major producers such as Brazil, well, things aren’t going to get better for U.S. exporters. 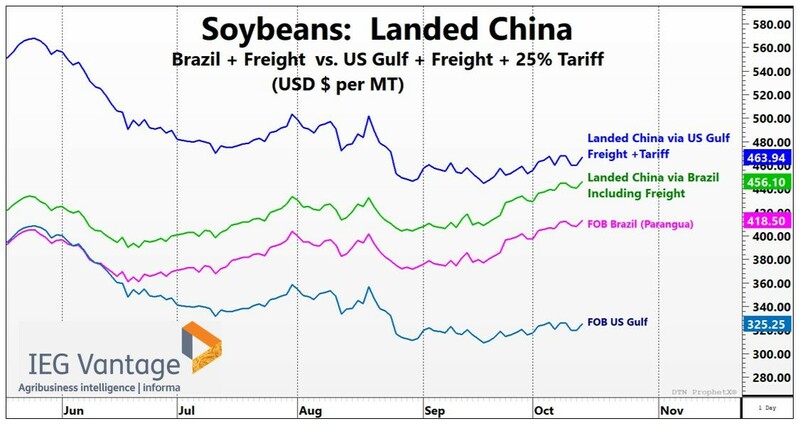 Take a look at this price comparison my Informa colleague Peter Rohde published last week, plotting U.S. and Brazilian soybeans delivered to China against one another (see figure below). Image courtesy of USDA’s Foreign Ag Service. So the U.S. share of exports to China are off 10 percentage points year-over-year, while Brazil’s share is up 18%! For current production, impact of the tariff conflict awaits the crop being planted in South America. Very different scenarios emerge if the South American crop is at or above vs. below trendline. Intermediate impact depends on whether the tariff conflict pushes China’s economy into recession, how impact on soybeans radiates out to other crops, plus unforeseen positive and negative events. Long run impact is troubling because the tariff conflict again raises the issue of how reliable is the US as a provider of the daily staff of life, a topic broached in a historical perspective of the USSR grain embargo in a July 13, 2018 farmdoc daily article (Zulauf, Coppess, Paulson, and Schnitkey). ~ Zulauf, C., G. Schnitkey, N. Paulson, J. Coppess “Value of US Production of Farm Commodities amid Tariff Conflict.” farmdoc daily (8):189, Department of Agricultural and Consumer Economics, University of Illinois at Urbana-Champaign, October 12, 2018. 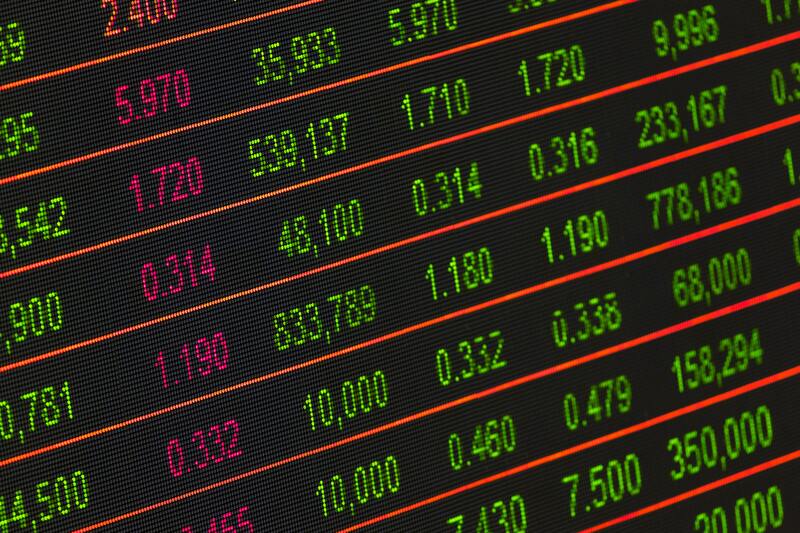 Earlier this month, Purdue University’s Center for Commercial Agriculture published its latest Ag Economy Barometer, finding that producer sentiment has reached its lowest level in two years. One wonders, just how long can they wait?